At 70 mph and timed right with the setting sun’s golden hour the wind turbine farm along HWY 84 between Lubbock and Dallas performs, and can be appreciated, just as Walter De Maria’s The Lightning Field in New Mexico. Only when placed in repetition, like one sees in wind turbine farms, Dia Art Foundation work, or harbor ports, do I appreciate the obstruction of a pole in the landscape. It is unfortunate then to observe installation of utility lighting as single steel stadium-like poles along the Marsha Sharp highway extension in Lubbock, Texas instead of lights suspended from lattice tower structures. The primary organization of these stadium-like poles is a factor of the road condition, such as highway overpasses increase light needs, instead for example the distance between poles determined as a factor of wind dynamics across turbine blades. one to see the object, and two, to see through the object. One can not see through a utility pole. Instead you are left with a singular condition, just the object itself. Additionally lattice tower structures are able to use smaller steel members, such as 1.5″ angle iron, to achieve the open airy matrix. 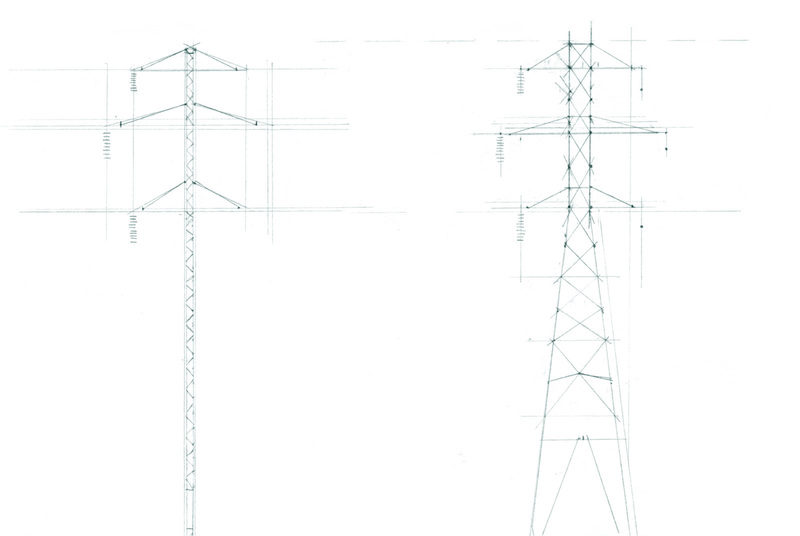 Lattice tower structures probably require more labor for assembly but the monolithic poles as objects alone offer no relationship of scaling between the person and environment. We are left with just the object, no space, rather than a relationship or material, space, and landscape. Science writer Brian Hayes compiled a fantastic guide of utility systems in Infrastructure: A Field Guide to the Industrial Landscape. It is a perfect resource with detailed information of dimensioned, engineered, and practiced conditions that allow us to better understand, and see, the infrastructure in our environment. This entry was posted in celestial, light, material, space, west texas and tagged Lattice tower structures, utility pole, Walter De Maria by vmcreynolds. Bookmark the permalink.